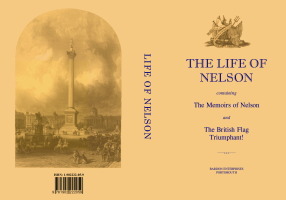 containing "The Memoirs of Nelson" & "The British Flag Triumphant!" Description: This book combines two books published in 1806. The first section (book), contains an biographical account concentrating on his naval exploits, and also containing a copy of his will. The second section (book), contains accounts of the naval encounters which were published in the “London Gazette.” This is prefixed with “an address to the officers, seamen, and marines of His Majesty’s Fleets.” The accounts included are:- 1. Lord Howe - 1 June 1794. 2. Adm. Cornwallis - 17 June 1795. 3. Lord Bridport - 23 June 1795. 4. Sir John Jervis - 14 Feb. 1797. 5. Admiral Duncan - 11 Oct. 1797. 6. Sir Horatio Nelson, The Nile - 1 Aug. 1798. 7. Sir Sydney Smith - 1799. 8. Lord Nelson, Copenhagen - 2 April 1801. 9. Sir J. Saumarez – 9 July 1801. 10. Lord Nelson, Trafalgar - 21 Oct. 1805. 11. Lord Collingwood's, Continuation. 12. Sir R. J. Strachan - 3 Nov. 1805. 13. Sir J. T. Duckworth - 6 Feb. 1806. A letter from Lord Howe. Account of public funeral of Lord Nelson.